Do You Know How Freedom Sounds? Find out by getting the latest album from San Francisco band Diskarte Namin. The album “Kultural Guerrillas” is a mix of reggae, rock, folk and soul accented with Philippine indigenous instruments and driven by lyrics about love and liberation. And it’s not just lip service—every album bought online will help support the struggle for human rights and self-determination in the Philippines. All proceeds from album sales go to BAYAN USA, a national alliance of 18 progressive Filipino organizations representing organizations of students, scholars, women, workers, artists, and youth. The International Conference on Human Rights in the Philippines, to be held in July 2013. This conference will bring together more Filipino survivors of human rights abuses, families of victims, and human rights advocates from around the globe to develop a shared analysis of the causes of the human rights crisis and to develop action plans to address the problem. Manilakbayan – Bringing Mindanao Peoples’ Voices from the Margins to the Center, a week-long mobilization convened by Mindanao’s “Anawim” or “the unprotected” indigenous Lumads, Moro, small farmers and workers. The mobilization will include actions to defend land, environment and human rights in the face of destructive large-scale mining and mining-related killings by state forces. Be part of the movement for international human rights! 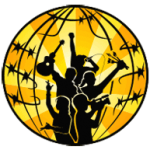 Support movement music and Filipino community organizing! Spread the word to fellow music lovers and justice seekers! All love donations are gratefully accepted. Special photo exhibit. Photos will be for sale. All proceeds go to Panaghiusa. On behalf of Habi Arts, we would like to appeal for the release of Ericson Acosta—an artist, poet, writer, cultural worker, and human rights activist—who is illegally detained at the sub-provincial jail of Calbayog City, Samar province. We call for his immediate and unconditional release for we believe he is held solely for peacefully exercising his right to freedom of expression, as guaranteed under Article 19 of the International Covenant of Civil and Political Rights, ratified by the Philippines. Today, November 15, also marks the “Day of the Imprisoned Writer”—an annual, international day intended to recognize and support writers who resist repression of the basic human right to freedom of expression and who stand up to attacks made against their right to impart information. It is a shock to us that Ericson Acosta still languishes in jail without trial and due process after more than one year and nine months. He is no criminal and no legal proceedings have taken place. Instead, bogus reasons have been used to keep Acosta in illegal detention—away from his family, friends, and the community in which he has dedicated his time to serving. Acosta was studying the human rights situation in marginalized and militarized communities in Samar when he was arrested without warrant by members of the 34th Infantry Battalion of the Philippine Army on February 13, 2011. The military alleged that a grenade was found on Acosta and then accused him of illegal possession of an explosive, which is a non-bailable offense. We urge Philippine authorities to free Ericson Acosta immediately. We demand that harassment toward Acosta’s family stop. We urge all to oppose attacks on artists and cultural workers—especially those facing repression and imprisonment—who use their talents and work to express the voice and struggles of the people. Art and activism is not a crime! FREE ALL POLITICAL PRISONERS IN THE PHILIPPINES! Join us as we protest the Noynoy Aquino administration’s signing of the Cybercrime Prevention Law and the escalating political killings across the Philippines under his regime. The Cybercrime Prevention Law violates people’s freedom of speech, internet freedom, and the right to privacy. It is being used as a way to censor and silence any dissent or criticism of the government. An anti-mining leader in Cagayan has already been arrested for a Facebook post, even though the law’s implementation has been temporarily suspended by the Supreme Court to review its unconstitutionality. We especially condemn the brutal massacre of an indigenous B’laan family by the Philippine military in Tampakan, South Cotabato, Mindanao. The soldiers shot up the home of indigenous leader Daguil Capion, killing and desecrating the bodies of his pregnant wife, Juvy (27), and her two sons, Jordan (13) and Janjan (8). He and the B’laan tribe have been fighting against the foreign mining operations of Xstrata Sagittarius Mining Inc., which would destroy the environment to steal the rich gold and copper deposits in their area.